Cut a little here, cut a little there. Do a little here, do a little there. These are the most basic ways to lose weight – to slash calories – that’s Diet 101. But how many do you really have to cut or burn to see results? 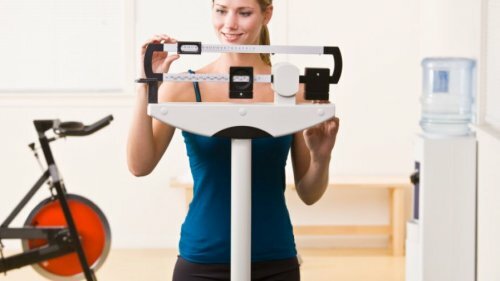 It’s simple – we all know that you have to slash 3500 calories to lose a pound, so you can definitely drop a pound a week by trimming 500 calories each day. Try these 25 easy tweaks—and get the slim body you want in no time, even if you hate exercising! Tap your foot. Your skinnier friends are probably fidgeters, who burn up to 350 calories a day just by tapping their feet or being restless. Try it for a few days. Walk around while you’re on the phone, or tap out a tune with your hands or feet (in the privacy of your own office, of course). In fact, do a couple of swaps a day and you can drop 10 pounds in 5 weeks! So try these 25 easy tweaks—and get the slim body you want in no time. Step away from the nuts. Especially if they’re in a big bowl. The bigger the serving bowl, the more you’ll eat, Cornell University researchers say. Nuts have heart-healthy fats, but they’re also high in calories: 1 handful (about 1 ounce) of oil-roasted mixed nuts has 175 calories; 3 handfuls have 525. Cut out nuts altogether and save more than 500 calories. Can’t resist ’em? Eat pistachios: 2 handfuls are just 159 calories, and the shelling will slow down your munching. Don’t eat in front of the TV. You’ll eat up to 288 calories more, according to research from the University of Massachusetts. Instead, eat at the table, and trade 1 hour of TV for a casual walk. Together, that’s 527 calories burned. Limit salad toppings. A big salad might seem healthy, but all those goodies on top can make it more calorie-laden than lasagna or fettuccine Alfredo. Cheese crumbles, caramelized nuts, bacon, avocado, dried fruit, croutons, and vinaigrettes can add lots of calories. Save 500 or more calories by having just one topping, adding flavorful but lower-cal veggies (roasted bell peppers, grilled onions, or mushrooms), and using half the dressing. Use smaller plates. Swap your 12-inch plate for a 10-inch one. You’ll eat 20 to 25% less—and save up to 500 calories. You won’t feel any less full, either, researchers say. Skip the whip. Or at least size it down. Dessert-like coffee creations can contain as many as 670 calories, with large sizes and options like whipped cream, whole milk, and syrups. Craving whipped cream? Try it on a shot of espresso for a total of just 30 calories. You save 640 calories! Keeping track of everything you eat, a lot people confuse the fullness factor(we'll get to that later) of some foods with high calories food, which could not be furthest from the truth, ice cream, nuts, chips, buttered popcorn and other things you mentioned contain high calories and are low on the FF, leaving you hungrier for more food, which would result in overeating. Creating a caloric deficit obviously will top every list( try to find your BMR then multiply by 1.1 to 1.6 depending on your activity level aka Harris Benedict Formula, and go from there, adjust the calories depending on a 1 week result or even a day). Fullness factor is key to a good and efficient diet, lets put it this way: the hungrier you are, the more likely that you'll overeat, consuming extra Calories that can quickly slow or reverse your weight loss, scientific research done, so selecting foods with higher Fullness Factors (usually foods rich in fibers and protein), you'll improve your chances of consuming fewer Calories, while simultaneously minimizing your hunger. PS: consistency is key to every effective diet.